When Tutubi first came to Donsol on Good Friday of 2003 to commune with butanding or whale sharks, it was an unplanned trip that he had no snorkels, vests and, worst of all, an underwater camera. The nearest one he can get that time was a Kodak disposable film camera with 27 shots and was also waterproof, problem with it was picture taken under water was poor, according to various reviews. Tutubi now has the Olympus Tough TG-2 since last year and its high aperture 2.0 waterproof and shockproof is probably the best in its class. So what did he get? 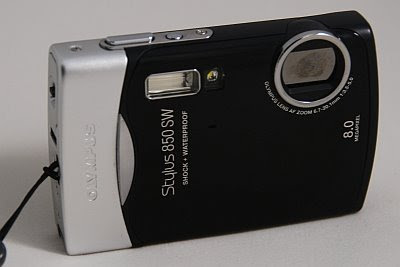 An Olympus Stylus 850 SW Shock + Waterproof Camera. This makes Tutubi a member of Nikon, Canon and Olympus users circle with his Nikon D80 DSLR + Nikkor 18-200 VR lens where most crappy pictures on this blog were taken with, his old trusty Canon Ixus 30 point and shoot camera he bought on Hidalgo, Quiapo and now the Olympus waterproof camera. How would Tutubi rate and review the Olympus waterproof camera? In simple terms, the image quality is not that well compared to his trusty Canon Ixus 30, but it can go to places where his Canon and Nikon cameras can't. With his new waterproof camera, he can now take photos of whale sharks in Donsol, during snorkeling, kayaking (where he needs a kayak-mount tripod), shoot a video of the rapids of Pagsanjan Falls or have fun with water in Paete's Salibanda. Cool! What would you recommend? Buy a water proof camera like this or just buy a waterproof case? Problem with waterproof case is it's very expensive and camera specific. If you change your camera, you won't have use for it. Unless you are a diver or spends a lot of time in water activities, a water proof case seems not a good option. Actually, I've seen some plastic (wallet-like) case used for water-proofing point and shoot cameras but I'm not sure if it's good and you will risk wetting your camera in case the plastic case leaks. good we'll wait for your intitial shots to be posted here. hi!i really love your blog =)im thinking of having a quiet get away to siquijor or maybe palawan..which do you think would be better..i've been missing philippines for quite some time now since i migrated here in the US..do you have any tips so that i can have a perfect vacay (hopefully) =) thanks and hoping for your quick reply. Look forward to see your Donsol pictures ! nina, suggest you just buy the case, probably a dicapac or click the link above for your other choices. Try leaving in an island south of Palawan . . . no script to follow, no one to cook for you and no one to entertain you . . . a not touristy place but if you are looking for adventure ala-survivor ang dating, then try Punta Sebaring. It is located in Bugsuk Island. . .
Tutubi, here's one unspoiled place for you; Town of Quezon, Quezon in the southern most part of Alabat Island, an hour boat ride from Gumaca. Will be going there mid part of February. You're welcome to explore it with me. I'll be your facilitator. My wife is from there. Tutubi, will send you some (amateurish) picture of Quezon, Quezon if our plan to go there February will materialize. Need to take Photography lesson from you and Sydney. Cannot join you in Tarantang bcoz I'll be staying with a cousin. Nakakahiyang umuwi ng madaling araw. But I plan to have breakfast at Kape Kesada on Sunday. Maybe meet you there for breakfast before Salibanda start? i have this exact camera.. i don't know what but it evenutally gave up on me.. after a year.. I'm beach fanatic.. but i guess the camera's not up for the challenge of ALWAYS being on water hahaha. Use GoPro HD Camera you can submerge the unit upto 60m.. you can have it for 15,500 only.